A custom made, hand carved, all wooden carousel built by famed animal carver Dan Hornberger with Brass Ring Entertainment now sits in the middle of Ackley Park thanks to an overwhelming number of donations from generous residents. When Elk Citians were looking ahead pondering ideas for a centennial celebration, somewhere came the idea of an old fashioned carousel. Research was done and the decision was made. Sounds easy and somehow City Officials, the Centennial Committee, and area residents made it happen just that easy. 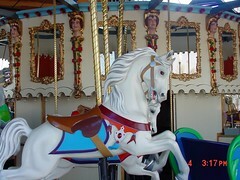 The Centennial Carousel needs to be a destination point for anyone traveling Interstate 40 (Old U.S. Highway 66) through western Oklahoma. You will simply be awestruck as what true pioneer spirit can accomplish. Ackley Park, 2717 W Third Elk City, Oklahoma. Next to Old Town Complex. Eastbound take I-40 Exit #32 and travel 5 miles along Old Highway 66. Westbound take I-40 Exit #41 and travel 4.8 miles on Old Highway 66. The museum is located on the north side of the road.